Worldwide. Highest species richness in tropical and subtropical regions. Worldwide: 5000 species in 230 genera. Predators of spiders. A single egg is layed on or in the abdomen of a spider that has been paralysed by the sting of the female wasp, either in the spider's own burrow or on a spider that has been paralysed, dragged and placed in a secluded crack, crevice, excavated burrow, or mud nest made by the wasp. Some species are cleptoparasites of other species, laying their egg on a previously paralysed and concealed spider. The Pompilid Project is a collaborative effort between James Pitts and Carol von Dohlen at Utah State University and a retired world authority on pompilids, Marius Wasbauer. Arnold, G. 1932. The Psammocharidae of the Ethiopian region. Part I. Subfamily Pepsinae. Annals of the Transvaal Museum 14: 284-396. Arnold, G. 1932. The Psammocharidae of the Ethiopian region. Part II. Subfamily Claveliinae, Haupt. Annals of the Transvaal Museum 15: 41-122. Arnold, G. 1933. Entomological expedition to Abyssinia, 1926-7. Hymenoptera, II. : Sphegidae and Psammocharidae. With an introductory note and supplementary list by Hugh Scott, Sc. D. The Annals and Magazine of Natural History 11: 351-371. Arnold, G. 1934. The Psammocharidae of the Ethiopian region. Part III. Annals of the Transvaal Museum 15: 283-399. Arnold, G. 1934. New African Hymenoptera No. 2. Occasional Papers of the Rhodesian Museum 3: 18-28. Arnold, G. 1935. The Psammocharidae of the Ethiopian region. Part IV. Annals of the Transvaal Museum 15: 413-483. Arnold, G. 1935. Mission J. de Lépinay au Soudan Français (1933-1934) (Douzième note). Hyménoptères. On some fossorial Hymenoptera from the Soudan. Bulletin de la Société des Sciences Naturelles du Maroc 15: 1-9. Arnold, G. 1935. Some considerations on a recent classification of the family Psammocharidae (Hymenoptera). Occasional Papers of the National Museum of Southern Rhodesia 4: 29-30. Arnold, G. 1936. The Psammocharidae of the Ethiopian region. Part V. Annals of the Transvaal Museum 18: 73-12. Arnold, G. 1936. The Psammocharidae of the Ethiopian region. Part VI. Annals of the Transvaal Museum 18: 415-460. Arnold, G. 1936. New African Hymenoptera No. 3. Occasional Papers of the Rhodesian Museum 5: 1-38, pl. I.
Arnold, G. 1937. The Psammocharidae of the Ethiopian region. Part VII. Annals of the Transvaal Museum 19: 1-98. Arnold, G. 1939. Notes on some African Pompilidae and descriptions of new species. Occasional Papers of the National Museum of Southern Rhodesia 8: 49-65. Pompilidae (Hymenoptera) from Southern Rhodesia. Journal of the Entomological Society of southern Africa 3: 30-34. Arnold, G. 1940. New species of African Hymenoptera No. 4. Annals of the Transvaal Museum 20: 101-143, pl. V.
Arnold, G. 1944. New species of African Hymenoptera. No. 5. Occasional Papers of the National Museum of Southern Rhodesia 11: 1-38. Arnold, G. 1946. New species of African Hymenoptera. No. 6. Occasional Papers of the National Museum of Southern Rhodesia 12: 63-97. Arnold, G. 1948. New species of African Hymenoptera. No. 8. Occasional Papers of the National Museum of Southern Rhodesia 14: 213-250. Arnold, G. 1949. New species of African Hymenoptera. No. 9. Occasional Papers of the National Museum of Southern Rhodesia 15: 261-275. Arnold, G. 1951. Sphecidae and Pompilidae (Hymenoptera) collected by Mr. K.M. Guichard in West Africa and Ethiopia. Bulletin of the British Museum (Natural History). Entomology 2: 95-183. Arnold, G. 1952. New species of African Hymenoptera No. 10. Occasional Papers of the National Museum of Southern Rhodesia No. 17:460-493. Arnold, G. 1955. New species of African Hymenoptera No. 11. Occasional Papers of the National Museum of Southern Rhodesia No. 20:733-762. Arnold, G. 1956. New species of African Hymenoptera No. 12. Occasional Papers of the National Museum of Southern Rhodesia No. 21B:52-77. Arnold, G. 1958. New species of African Hymenoptera No. 13. Occasional Papers of the National Museum of Southern Rhodesia No. 22B:119-143. Arnold, G. 1959. New species of African Hymenoptera No. 14. Occasional Papers of the National Museum of Southern Rhodesia No. 23B:316-339. Arnold, G. 1960. Aculeate Hymenoptera from the Drakensberg Mountains, Natal. Annals of the Natal Museum 15:79-87. Arnold, G. 1962. 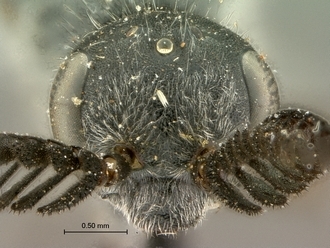 New species of African Hymenoptera No. 16. Occasional Papers of the National Museum of Southern Rhodesia No. 26B:844-855. Banks, N. 1940. Some Psammocharidae from Madagascar (Hymenoptera). Proceedings of the Academy of Natural Sciences of Philadelphia 92: 335-362. Berland, L. 1925. Hyménoptères – Fossores et Mellifera. Mission Rohan-Chabot Angola et Rhodesia (1912-1914). IV, fasc. 3 : 147-158, Imprimerie Nationale, Paris. Berland, L. 1952. La Réserve naturelle intégrale du Mont Nimna. XII – Hyménoptères vespiformes. Mémoires de l’Institut Français d’Afrique Noire. n° 19 : 271-276. Ifan-Dakar. Bingham, C.T. 1902a. On the Hymenoptera collected by Mr W.L. Distant in Transvaal, South Africa, with descriptions of supposed new species. Annals and Magazine of Natural History, 10, ser. 7: 207-353. London. Bingham, C.T. 1902b. Descriptions of new species of South African Hymenoptera. Transactions of the Entomological Society of London, 36, part 3: 544-547. Bischoff, H. 1911. Ergebnisse der Deutschen Zentral-Afrika Expedition 1910-1911, III: 218-219. Bischoff, H. 1913. Psammochariden und Crabroniden aus Rhodesia. Archiv für Naturgeschichte, 3, 79, I: 43-76; Pompilides: 43-64. Berlin. Bischoff, H. 1913. in Schultze’s Reise Ost-Afrika. Bischoff, H. 1915. Zoologische Ergebnisse der Professor Hans Meyerschen Expedition nach Ostafrika 1911. 1. Verzeichnis und Beschreibungen des gesammelten Hymenopteren. Mitteilungen aus dem Zoologischen Museum in Berlin, 7, hft 3: 473-477. Bradley, J.C. 1957. The types of Hymenoptera described by Amédée Lepeletier Comte de Saint Fargeau. Annali del Museo Civico di Storia Naturale di Genova, LXIX: 36-50. Brauns, H. 1899. Zur Kenntnis der Südafrikanischen Hymenopteren. Annalen des K.K. Naturhistorischen Hof Museums, 13: 382-423. Brauns, H. 1905 1899. Zur Kenntnis der Südafrikanischen Hymenopteren. Annalen des K.K. Naturhistorischen Hof Museums, 13: 43-59. Brauns, H. 1906. Zur Kenntnis der südafrikanischen Hymenopteren II. Verhandlungen der Zoologisch-Botanischen Gesellschaft in Wien, 56; Pompilides: 43-59. Buxton, R.D. 1937. Insects of the Lake Rudolf Rift Valley Expedition, 1934. Orders other than Coleoptera. Annals and Magazine of Natural History, 20; Pompilides: 587. London. Buysson, R. du 1897. Voyage de M.E. Simon dans l’Afrique Australe (Janvier-avril 1893) 6ème Mémoire. Hyménoptères.. Annales de la Société entomologique de France, 66 : 351-363, pl. Cameron, P. 1904a. Description of a new species of Apteropompilus from South Africa. Zeitschrift für Systematische Hymenopterologie und Dipterologie, IV: 176. Cameron, P. 1904b. Description of New Genera and Species of Hymenoptera from Dunbrody, Cape Colony. Record of the Albany Museum, 1, part 3: 125-160; Pompilides: 125-139. Grahamstown. Cameron, P. 1904. On the Hymenoptera of the Albany Museum, Grahamstown, South Africa. Record of the Albany Museum 1: 165-175. Cameron, P. 1905a. On the Hymenoptera of the Albany Museum – Second Paper. Record of the Albany Museum, 1: 185-244; Pompilides: 212-224. Cameron, P. 1905b. On the Hymenoptera of the Albany Museum, Grahamstown, South Africa. Third Paper. Record of the Albany Museum, 1, part 5: 297-314; Pompilides: 303. Grahamstown. Cameron, P. 1905c. On some new genera and species of Hymenopetra collected by the Revd. J.A. O’NEIL S.J. chiefly at Dunbrody, Cape Colony. Record of the Albany Museum, 1, 245-? ; Pompilides: 262-263. Grahamstown. Cameron, P. 1905d. On some new genera and species of Hymenoptera from Cape Colony and Transvaal. Transactions of the South African Philosophical Society, 15, (4): 195-257. Cameron, P. 1905e. Description of a new species of Pseudagenia (Hymenoptera, Pompilidae) from Natal. The Entomologist, 38, n° 507: 223-224. Cameron, P. 1910a. in Sjöstedts Kilimandjaro Meru Expedition 1905-1910. Fossores Wissenschaftliche Ergebnisse der Schwedische Zoologische Expedition nach dem Kilimandjaro, den Meru und dem umgebenden Masai-steppen, Deutsch Ostafrikas. 1905-1906. Y.Sjöstedt edit. 2 , (8): 169-296; Pompilides: 241-261. Cassolari, C. & Casolari Moreno, R. 1980. Cataloghi I – Collezione Imenotterologica di Massimiliano Spinola. Museo Regionale di Scienze Naturali. 165 pp., Torino. Chapman, R.F. 1958. The nest of Pseudagenia mygnimioides Bisch. Entomologist’s Monthly Magazine, XCIV: 215. Dalla Torre, C.G. 1895. Ueber die Gattung Ceropales. Wiener Entomologische Zeitung, 14: 90-92. Dalla Torre, C.G. 1897. Catalogus Hymenopterorum hucusque descriptorum systematicus et synonymicus. Vol. VIII: Fossores (Sphegidae). Lipsiae ; Pompilidae : 195-346. Day, M.C. 1974a. A contribution to the taxonomy of the genus Anoplius Dufour (Hymenoptera : Pompilidae) including a revision of the paleotropical subgenus Orientanoplius Haupt. Bulletin of the British Museum (Natural History) Entomology, 30, n° 8 : 375-404, figs. London. Day, M.C. 1974b. A revision of Atopopompilus Arnold, with a note on the identity of Anoplinellus Banks (Hymenoptera : Pompilidae). Bulletin of the British Museum (Natural History) Entomology, 31, n° 3 : 47-69, figs. London. Day, M.C. 1979. The species of Hymenoptera described by Linnaeus in the genera Sphex, Chrysis, Vespa, Apis and Mutilla. Biological Journal of the Linnean Society, 12 : 45-84. Day, M.C. 1981. A revision of Pompilus Fabricius (Hymenoptera : Pompilidae), with further nomenclatural and biological considerations. Bulletin of the British Museum (Natural History) Entomology, 42, n° 1 : 1-42, figs. London. Day, M.C. 1984. Male polymorphism in some Old World species of Cryptocheilus Panzer (Hymenoptera Pompilidae). Zoological Journal of the Linnean Society, 80: 83-101, 5 figs. Day, M.C. 1988. Spider wasps. Hymenoptera: Pompilidae. Handbooks for the Identification of British Insects Vol. VI, Part 4. Royal Entomological Society of London: London. De Saeger, H. 1945. Contribution à l'étude des Hyménoptères du Congo belge: Pompilidae. Revue de Zoologie et de Botanique africaine, 39, 1: 78-114. Elliott, M.G. 2007. Annotated catalogue of the Pompilidae (Hymenoptera) of Australia. Zootaxa 1428: 1–83. Emery, C., Gribodo, G & Kriechbaumer, G.. 1896. 2ème Contribution à Rassegna del’ Imenotteri récoltés au Mozambique par Car. Fornasini. Memorie della Reale Accademia delle Scienze dell’ Istituto di Bologna,Ser.V, Tome V: 323-366; Pompilidae: 357-360. Evans HE. 1972. The tribe Ctenoceratini in Australia (Hymenoptera: Pompilidae). Australian Journal of Entomology 11: 244–252. Fabricius, J.C. 1775. Systema Entomologiae. (30). + 832 pp. Flensburgi et Lipsiae. Fabricius, J.C. 1781. Species Insectorum. 1 i-viii + 552 pp. Hamb. & Kilonii. published in 1872, see Hope 1847. Fabricius, J.C. 1793. Entomologia Systematica Emandata et Aucta. 2. viii + 519 pp., Copenhagen. Fabricius, J.C. 1794. Entomologia Systematica Emandata et Aucta. 4. (8)i + 472 pp., Copenhagen. Fabricius, J.C. 1798. Supplementum Entomologiae Systematicae. (4) + 472 pp. Copenhagen. Fabricius, J.C. 1804. Systema Piezatorum . xiv. + 439 pp. Brunswick. Gerlach, J., Matyot, P. & Saaristo, M. 1997. Silhouette species list. Phelsuma 5 (supplement A), 42 pages. Gerstäcker, C.E.A. 1857. Ubersicht der von Hr PETERS in Mossambique aufgefundenen und von Hrn Gerstaeker bearbeiteten Hymenopteren aus den Familien der Crabonites, Sphegides, Pompilidae und Heterogyna. Monatsberichte der der Königlichen Preussichen Akademie der Wisssenschaften zu Berlin, p. 509-513; Pompilidae: p. 511. Gerstäcker, C.E..A. 1857. Titre inconnu. Archiv für Naturgeschichte, 22, bd. 2: 273-486; Pompilidae: 392-393. Gerstäcker, C.E.A. 1858. Ubersicht der von ihm [Hrn PETERS] in Mossambique aufgefundenen und von Hrn Dr Gerstaeker bearbeiteten Hymenopteren aus den Familien der Crabonites, Sphegidae, Pompilidae und Heterogyna. Monatsberichte der der Königlichen Preussichen Akademie der Wisssenschaften zu Berlin, 1857: 509-513; Pompilidae: p. 511. Gerstäcker, C.E..A. 1862. in Peters, W.C.H. (ed.) Naturwissenschaftliche Reise nach . Mossambique auf befehl Seiner Majestät des Königs Friedrich Wilhelm IV in den Jahren 1842 bis 1848 ausgefürt, Zoologie V. (Hymenoptera) : 439-526, Berlin..
Gerstäcker, C.E..A. 1871. Beitrag zur Insektenfauna von Zanzibar. Archiv für Naturgeschichte, pt. 1: 345-363; Pompilidae: 351-352. Gerstäcker, C.E..A. 1873. in Baron Carl Clauss von der DECKEN’S Reisen in Ost Africa in den Jahren 1855-1865, Dritto Band, Wissenschafliche Ergebnisse, Zweite Abteilung, Gliederthiere (Insekten, Arachniden, Myriapode und Isopoden: 1-542, 18 Planches; Pompilidae: 327-330; Leipzig & Heidelberg. Gess FW. 1981. Some aspects of an ethological study of the aculeate wasps and the bees of a karroid area in the vicinity of Grahamstown, South Africa. Annals of the Cape Provincial Museum, Natural History 14: 1–80. Gess FW, Gess SK. 1974. An ethological study of Dichragenia pulchricoma (Arnold) (Hymenoptera: Pompilidae), a southern African spider-hunting wasp which builds a turreted subterranean nest. Annals of the Cape Provincial Museums 9: 187–214. Gess FW, Gess SK. 1976. Ethological notes on Dichragenia neavei (Kohl) (Hymenoptera: Pompilidae), an African spider-hunting wasp building a turreted, subterranean nest. Annals of the Cape Provincial Museums 11: 129–134. Gess, FW & Gess SK, 1977. Bricks without straw the nesting of the wasp Dichragenia pulchricoma (Arnold). The Eastern Cape Naturalist, 61: 6-8. Gess, F.W. & Gess S.K. 1980. Spider vanquishers: the nesting of Tachyompilus ignitus (Smith) and Batozonellus fuliginosus (Klug). The Eastern Cape Naturalist 69: 4-7. Giner Mari, J. 1945. Himenopteros del Sahara espanol. Familias : Sphecidae, Psammocharidae, Apterogynidae y Mutillidae. Eos, 21: 242-244. Gribodo, G. 1881. Spedizione Italiana nell’ Africa equatoriale. Risultati zoologici Imenotteri. Annali del Museo Civico di Storia Naturale di Genova Giacomo Doria, 16: 226-269; Pompilidae: 244-249. Gribodo, G. 1884. Viaggio ab Assab nel Mar Rosso, dei signori G.Doria ed O. Beccari con il R. Avviso “Esploratore” dal 16 Novembre 1879 al 26 Febbraio 1880. Annali del Museo Civico di Storia Naturale di Genova Giacomo Doria, 206: Pompilidae: 384-386. Gribodo, G. 1884. Spedizione Italiana nell’ Africa equatoriale. Risultati zoologici Imenotteri. Memoria seconda. Annali del Museo Civico di Storia Naturale di Genova Giacomo Doria , 21: 277-325; Pompilidae: 302-313..
Gribodo, G. 1894a. Hymenopterorum novorum diagnoses praecursoriae. Miscellanea Entomologica, Nuntius Entomologicus Internationalis, vol. 2, n°1: 2-3. Gribodo, G. 1894b. II. Aculeati e Chrisidi – in Emery, C., Gribodo, G. & Kriechbaumer, G., Rassegna degli Imenotteri raccolti nel Mozambico dal Cav. Formasini esistenti nel Museo Zoologico della R. Universita di Bologna. Memorie dell’ Istituto Nazionale Italiano, Novi Commentarii Academiae Scientarum Instituti Bononiensis, ser.V, 4, 1) : 113-152 ; Pompilides : 141-147. Gribodo, G. 1897. Seconda Contribuzione alla conscenza della fauna imenotterologica del Mozambico. Memorie della Reale Accademia delle Scienze dell’ Istituto di Bologna,Ser.V, Tome V: 77-120; Pompilidae: 37-40. .
Grout, T.G. & Brothers, D. 1982. Behaviour of a parasitic pompilid wasp (Hymenoptera). Journal of the Entomological Society of South Africa 45, p. 217-220. Grünwaldt, W. 1933. Die Claveliinen Gattung Euclavelia Arn. (Hym. Psammocharidae). Entomolog. Meddelelser. 18, hft. 3, p. 252-258. Guérin-Méneville, F.E. in Duperrey 1831. Voyage de la Coquille, Zoologie, 2, part 2, Hymenoptera, pl. 8. Guérin-Méneville, F.E. in Duperrey 1830-38. Voyage de la Coquille, Zoologie, 2, Crustacés, Arachnides et Insectes(texte) div. I, 319 pp. Guérin-Méneville, F.E. in Cuvier 1844. Iconographie du Règne Animal, VIII, p. 434. Guérin-Méneville, F.E. in Lefebure 1848. Voyage en Abyssinie, Insectes, VI, part 4 ; Pompilides : p. 354-356. Guiglia, D. 1928. Di alcune specie d’Imenotteri raccolte dal Prof. Doll. G. Paoli nella Somalia Italiana (1926). Annali del Museo Civico di Storia Naturali, Genova, LII : p. 487-502. Guiglia, D. 1929. Risultati Zoologici della Missione inviata dalla R. Societa Geografica Italiana per l’esplorazione dell’ oasi di Giarabub (1926-1927). Annali del Museo Civico di Storia Naturali, Genova, LIII, p. 393-421. Guiglia, D. 1931. Spedizione del Barone Raimondo Franchetti in Dancalia, Imenotteri Aculati. Annali del Museo Civico di Storia Naturali, Genova, LV, p. 157-164. Guiglia, D. 1932. Contributo alla Conoscenza della fauna imenotterologica dell’ Africa Orientale, Imenoteri aculeati. Memoria della Societa entomologica Italiana, X, fasc. II, p.118-136; Pompilidae, p. 128-131. Guiglia, D. 1932. Spedizione scientifica all’ Oasi di Cufra (Marzo-Luglio 1931). Imenotteri Aculeati, 1 parte – Fosssores. Annali del Museo Civico di Storia Naturali, Genova, LV, p. 466-486. Guiglia, D. 1932. Missione scientifica del Prof. E. Zavattari nel Fezzan 1931). Bolletino della Societa Entomologica Italiana, 64, n° 6, p. 99-106. Firenze, Genova. Guiglia, D. 1939. Missione Biologica nel Paese di Bovano III, Raccolti Zoologici, Parte 2, Hymenoptera : Chrysididae, Scoliidae, Mutillidae, Vespidae, Psammocharidae, Sphecidae). R. Accad. Italia, Roma, p. 45-77, Tav. II et III, fig. 4. Guiglia, D. 1940. Imenotteri aculeati (Chrysididae, Scoliidae, Mutillidae, Vespidae, Psammocharidae, Apidae) raccolti in Africa Orientale dal Prof. G. Russo. Bolletino del Laboratorio Zoologica Portici, 31, p. 274-292, figs. Guiglia, D. 1940. Di alcune specie d’Imenotteri aculeati dell’ Africa Orientale Italiana delle cllezioni del Museo Civico di Storia Natueale di Triese (Scoliidae, Vespudae, Pompilidae, Sphecidae, Apidae). Atti del Museo Civico di Storia Naturale di Trieste, XIV, n° 19: 287-298, figs. Guiglia, D. 1940. Missione Ittiologica in A.O.I. 1937-38). Materiali Zoologici. Hymenoptera: Scoliidae, Pompilidae, Sphecidae, Apidae. Atti del Museo Civico di Storia Naturale di Trieste, XIV, n° 18: 276-278; Pompilidae: . 275-282. Guiglia, D. 1943. Nuove specie d’ Imenotteri Aculeati (Pompilidae-Sphecidae) Diagnosis preventive. Missione bilogica Sagan-Omo diretta dal Prof. E. Zavattari. Bolletino della Societa Entomologica Italiana, LXXV, n° 6: 68-76; Pompilidae: 69-72. Guiglia, D. 1948. I tipo di Imenotteri del Guérin esistenti nelle coolezioni del Museo di Genova. Annali del Museo di Storia naturale di Genova, 63: 175-191, 5 figs. Guiglia, D. 1952. I Tipi di Imenotteri del Guérin esistenti nelmle collezioni del Museo di Parigi. Doriana (suppl.. Annali del Museo di Storia naturale di Genova), I, n° 22. Guiglia, D. 1956. Missione del Prof. Giuseppe Scortecci in Migiurtinia. III. Hymenoptera. Annali del Museo di Storia naturale ”Giacomo Doria” di Genova, 68: 306-311, 1 pl. Guiglia, D. 1959. Missione del Prof. Giuseppe Scortecci in Migiurtinia (Somaia Sett.) Hymenoptera: Vespidae, Pompilidae, Sphecidae, Apidae). Atti della Societa Italiana Scienze Naturale di Milano, 98 : 310-319. Guiglia, D. & Pasteels, J. 1961. Aggiunte ed Osservacioni all’ elenco delle specie di Imenotteri descritte de Guérin-Meneville che si trovano nelle collezioni del Museo di Genova. Annali del Museo di Storia naturale”Giacomo Doria” di Genova, 72: 17-20. Haupt, H. 1929. Voyage au Congo de S.A.R. le Prince Léopold de Belgique 1925). Hymenoptera III, Psammocharidae . Revue de Zoologie et de Botanique Africaine 17 : 193-207. Haupt, H. 1929. Weiterer Ausbau meines Systems der Psammocharidae. Mit Beschreibung neuer Gattungen und Arten. Mitteilungen aus dem Zoologische Museum in Berlin, 15, hft 1: 109-117, figs. Haupt, H. 1930. Die Einordnung der mir bekannten Psammocharidae mit 2 Cubitalzellen in mein System. -Mitteilungen aus dem Zoologisch Museum in Berlin, 16, heft 5: 673-797, figs. Haupt, H. 1933. Von S.K.H. dem Prinzen Leopold von Belgien in 1929 und 1932 gesammelten Hymenopteren. Famille Psammocharidae. Bulletin du Musée Royal Histoire naturelle de Belgique 9, n° 47 : 1-5. Haupt, H. 1934 1935. Psammocharidae Mediterraneae II. Bollettino del Laboratorio di Entomologia del R. Istituto Superiore Agrario di Bologna, VII: 263-302, figs 1-XVIII. Haupt, H. 1950. Exploration du Parc National Albert. Mission G.F. de Witte 1933-35). Pompilidae. Institut des Parcs nationaux du Congo belge, fasc. 69 : 1-61. Haupt, H. 1957. Exploration du Parc National Albert. Mission G.F. de Witte 1933-35). Pompilidae. II partie. Institut des Parcs nationaux du Congo belge, fasc. 89 : 1-36. Haupt, H. 1959. Elemente einer systematischen Aufteilung der Macromerinae m. (Hy. Sphe). Fam. Pompilidae, Subf. Macromerinae. Nova Acta Leopoldina (N.S.) 21, n° 141 : 1-74, 33 figs. Leipzig. Haupt, H. (M.S.) Die Gattungen der Pepsinae der Erde, zum grössten Teil auch mit ihren Arten. Nova Acta Leopoldina N.F., Bd 15 1945, non publié) :145-429. Heymons, 1915. *** . Sitzungsberichte der Ges. Naturforschenden Freund., Berlin. n° 7: 301-308. Jacot-Guillarmod, C. 1961. The Hymenopterous types of Peter Cameron in the Albany Museum, Grahamstown, South Africa. Annal of the Cap Province Museum, Grahamstown, 1: 1-14. Kohl, F.F. 1884. Zur Hymenopterenfauna Afrika. Annalen der K.K. Naturhistorischen Hofmuseums, 9, hft 3, Pompilidae: 306-343, pl. 14. Kohl, F.F. 1885. Die Gattungen der Pompiliden. Verhandlungen zoologisch-botanischen Gesellschaft in Wien 34: 33–58. Kohl, F.F. 1886. Neue Pompiliden in den Sammlungen des k.k. naturhistorischen hofmuseums. Verhandlungen der.Zoologisch.-Boanischen Gesellschaft in Wien, 36 : 307-346. Wien. Kohl, F.F. 1888. Neue Pompiliden in den Sammlungen des k.k. naturhistorischen hofmuseums. Verhandlungen der.Zoologisch.-Boanischen Gesellschaft in Wien, 38 : 133-156. Wien. Kohl, F.F. 1893. Hymenopteren von Herrn Dr. Fr. Stuhlman in Ostafrika gesammelt. Jahrbericht des Hamburg Wissenschaf Anstalten 10 : 181-191, 1pl. ; Pompilidae : 183-186. Kohl, F.F. 1899. Zur Kenntniss der Hymenopteren gattung Eidopompilus Kohl. Annalen des Naturhistorischen Museums in Wien 15: 142–148. Kohl, F.F. 1909. ou 1905 in Voeltzkow Reise in Ostafrica, Sphegiden und Pompiliden von Madagascar, den Comoren und Ostafrika. II : 369-378. Kohl, F.F. 1913. Neue Pompiliden und Sphegieen vom Belgischen Congogebiete. Revue de Zoologie et de Botanique Africaine, III : 182-209 ; Pompilidae : 182-204, 47 figs. Lepeletier, A. 1845. Histoire naturelle des insectes, Hyménoptères III. Pompilidae. Librairie encyclopédique de Roret, Paris. 646 pp. Linné, C. von. 1758. Systema Naturae. Editio X, Holmiae. Lucas, R. 1898. in Stadelmann, H. Die Hymenopteren Ost-Afrikas, Pompilidae. Deusch-Ost-Afrika, Band IV : Pompilidae : 57-74. Móczar, L. 1978. New species and some remarks on the genus Ceropales Latreille (Hymenoptera: Ceropalidae). Acta Biologica Szeged. 24:115-137. Móczar, L. 1986a. Revision of the fulvipes-, ruficornis- and variegata-groups of the genus Ceropales Latreille (Hym., Ceropalidae). Acta Biol. Szeged 32:121-136. Móczar, L. 1986b. Revision of the genus Hemiceropales Priesner, 1969 (Hymenoptera: Ceropalidae). Acta Zoologica Hungarica 32:317-342. Móczar, L. 1987. Revision of the maculata and albicincta groups of the genus Ceropales Latreille (Hymenoptera: Ceropalidae). Acta Zoologica Hungarica 33:121-156. Móczar, L. 1988. Revision on the subgenus Priesnerius Móczar (Hymenoptera, Ceropalidae). Linzer biol. Beitr. 20:119-160. Móczar, L. 1989. Revision of the helvetica group of the genus Ceropales. Beitr. Ent. 39:9-61. Móczar, L. 1990. Revision of the subgenus Bifidoceropales Priesner of the genus Ceropales Latreille (Hymenoptera: Ceropalidae). Acta Zoologica Hungarica 36:59-85. Móczar, L. 1991. Supplement to the revision of the genus Ceropales Latreille, 1. (Hymenopteera, Ceropalidae). Acta Zoologica Hungarica 37:67-74. Pate, V.S.L. 1946. The Generic Names of the Spider Wasps (Psammocharidae olim Pompilidae) and Their Type Species (Hymenoptera, Aculeata). Transactions of the American Entomological Society, 72: 65-137. Picker, M., Griffiths, C & Weaving, A. 2002. Field Guide to Insects of South Africa. Struik Publishers, Cape Town. Pitts, J.P., Wasbauer, M.S. and Von Dohlen, C.D. (2006). Preliminary morphological analysis of relationships between the spider wasp subfamilies (Hymenoptera: Pompilidae): revisiting an old problem. Zoologica Scripta 35: 1–22. Radoszkowskij, O. 1881. Hyménoptères d’Angola. Jornal de Sciencias Mathematicas, Physicas e Naturae, ser. 1, 8, XXXI : 197-221, Lisboa ; Pompilidae : 211-214. Radoszkowskij, O. 1888 1889. Revision des Armatures copulatrices des mâles de la famille Pompilidae. Bulletin de la Société impériale des Naturalistes de Moscou, N.S., 2 : 462-493, 3 pl. Schulthess, A. von 1914. Hymenopteren aus Kamerun gesammelt von Hern van Ropthkirch Oberlieutenant der Schuztruppe. Deutsche Entomologische Zeitschrift: 283-297, Berlin; Pompilidae: 286-287. Smith, F. 1855. Catalogue of Hymenopterous Insects in the Collection of the British Museuim. Part III. 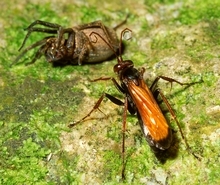 Mutillidae and Pompilidae. London: 1-206, 6 pls. Saussure H de. 1890-1891. Histoire naturelle des Hymenoptères. Grandidier, Alfred, Histoire physique, naturelle et politique de Madagascar. v. 20. Paris: L'Imprimerie nationale,1890-91. Taschenberg, E. 1869. Die Pompiliden des Museums der Universität zu Halle. Zeitschrift für die Gesammten Naturwissenschaften Halla, 34: 25-75; Halle. Tullgren, A. 1904. On some Hymenoptera Aculeata from the Cameroons. Arkiv för Zoologi, 1: 425-463, 4 pls, Stockholm. Turner, R.E. 1912. XVIII. On new Species of Fossorial Hymenoptera from Africa, mostly Elidinae. Transactions of the Entomological Society of London, part IV: 720-754; Pompilidae: 744. Turner, R.E. 1915. Notes and Synonymy of the Hymenoptera in the collection of the British Museum. II. Family Psammocharidae. Annals and Magazine of Natural History, including Zoology, ser. 8, 16: 332-335. Turner, R.E. 1918. Notes on Fossorial Hymenoptera. XXXIII. On new Ethiopian Species of Psammocharidae. Annals and Magazine of Natural History, including Zoology, ser. 9, vol. 1: 284-294. ser. 9, vol. 1: 284-294. Wahis, R. 1984. Contribution à la connaissance des Ceropales de l’Afrique tropicale. (Hymenoptera : Pompilidae, Ceropalinae) Description d’une espèce nouvelle du Zaïre. Revue de Zoologie africaine, 98, 3 : 560-562. Wahis, R. 1988. Hyménoptères Pompilides de Madagascar.. Genres Ceropales Latreille et Irenangelus Schulz. Hymenoptera : Pompilidae). . Revue de Zoologie africaine,:102 : 213-221.
française de l’Europe. Genre Cryptocheilus Panzer (Hymenoptera: Pompilidae, Pepsinae). Notes fauniques de Gembloux 33: 1-66. Wahis, R. 1998. Contribution à la connaissance des Hyménoptères Pompilides de la Turquie (Hymenoptera: Pompilidae). Bulletin et Annales de la Société royale belge d’Entomologie 134: 147- 158. Wahis, R. 1999. Révision des espèces afrotropicales et orientale du genre Pygmachus Haupt 1930 (Hymenoptera: Pompilidae, Pompilinae). Notes fauniques de Gembloux, n° 37 : 81-94. Wahis, R. 2000. Révision des espèces afrotropicales, indo-orientales et australiennes du genre Java Pate 1946 (Hymenoptera : Pompilidae, Pepsinae). Notes fauniques de Gembloux, n° 38 : 43-76..
Wahis, R. 2000. Hyménoptères Pompilides de Madagascar. 2. Genres Aporinellus Banks, Ferreola Lepeletier et Homonotus Dahlbom (Hymenoptera : Pompilidae). Notes fauniques de Gembloux, n° 39 : 45-77. Wahis, R. 2000. Sur quelques Pompilides afrotropicaux.décrits par G. Gribodo en 1894. Notes fauniques de Gembloux, n° 40 : 77-81. Wahis, R. 2003. Sur un genre peu connu de Pompilides afrotropicaux Kyphopompilus Arnold, 1959 (Hymenoptera : Pompilidae, Pompilinae). Notes fauniques de Gembloux, n° 49 : 103-114. Wahis, R. 2006. Mise à jour du Catalogue systématique des Hyménoptères Pompilides de la région ouesteuropéenne. Additions et Corrections. Notes fauniques de Gembloux 59: 31-36. Wahis, R. 2000. Revision des especes afrotropicales, indo-orientales et australiennes du genre Java Pate 1946 (Hymenoptera: Pompilidae, Pepsinae). Notes Fauniques de Gembloux 38, 43-76. Waichert C, Pitts JP. 2011. Description of a new Abernessia with notes on Neotropical Ctenocerinae (Hymenoptera: Pompilidae). Annals of the Entomological Society of America 104: 1279–1284. Wasbauer, M.S. 1995. Pompilidae. In: P. E. Hanson & I. D. Gauld (Eds) The Hymenoptera of Costa Rica (pp. 522–539). Oxford: Oxford University Press.